Lyrical prose and richly textured paintings invite young readers to come along and explore the magical world that opens up between dusk and dawn. PreS-K. 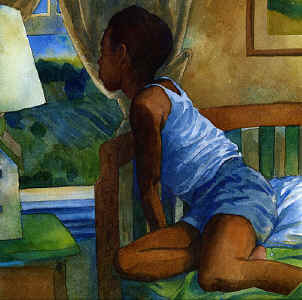 In his room at night, a boy looks outside and tries to imagine what is making the noise he hears. At each turn of the page, he tries out a new idea: "It is the calf, I think, / on the loose / that calls out waaah, / that calls out maaah . . ." Using the same form of rhythm and rhyme and many of the same words on each double-page spread, the text falls into a pattern that moves the story along almost musically; as the pages turn, the focus shifts from the boy to the animals, then back to the farm and the boy's bedroom. The mesmerizing effect of the verse makes this a good bedtime story, and it's no surprise that the boy is falling asleep on the last page. Ransome makes the most of the simple story with graceful scenes of the African American boy and the rural night scenes he sees and imagines. Every firefly and moonlit flash of white glows against the muted colors, while in the shadows, viewers can discern a cat on the prowl and frogs in the dark waters of the pond. 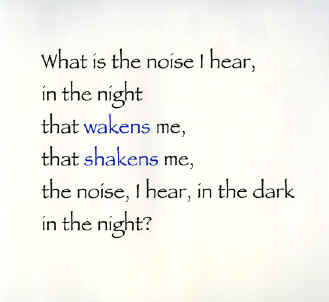 PreS-Gr 1 – In this inviting story, a child sits on his bed looking out his window and wonders, "What is the noise I hear,/in the night/that wakens me/that shakens me…" At first, he is alarmed, but as he considers all the homey things that could make the sound, he calms. It is only the wind saying goodnight. Wolff’s soothing, repetitive verse re-creates the comforting sounds of the country at night. Children will enjoy the onomatopoetic rhymes. "It is the sheet, I think,/on the line/that rustles swish/that rustles twish…" The quiet mood of the text is reflected in Ransome’s masterful watercolor illustrations…The rich art and rhythmic text make this an excellent bedtime read-aloud.